Happy Holidays! Bells will be ringing with this winning combination, Krispettes and our artisan Shortbread, Sugar Cookies, and Gingerbread; this suite is ideal for a party or meeting. 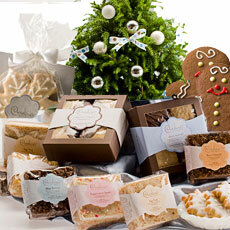 It features some of our yummiest treats perfect for holiday sharing. Assorted Krispettes - 1 dozen - Varies. Minimum of six varieties with Peppermint Spark, Egg Nog, Roca Crunch, Mint Everest, Triple Chocolate Nirvana, Happy Camper Crunch, and more.